Happy back to school day! I am not in school, but I do work at one which means I get to celebrate! I’ve always loved the first day of school. New clothes, new pens and pencils, new backpack, and a fresh start! We spent the long weekend doing just what you are supposed to do before school starts up again….spend time with friends and have fun! We had a great time up at my mom’s lake cottage. We went for walks, canoed, ate yummy food, grilled burgers, and spent some time on the lake. Wrigley had a blast playing with my mom’s dog, Sydney. 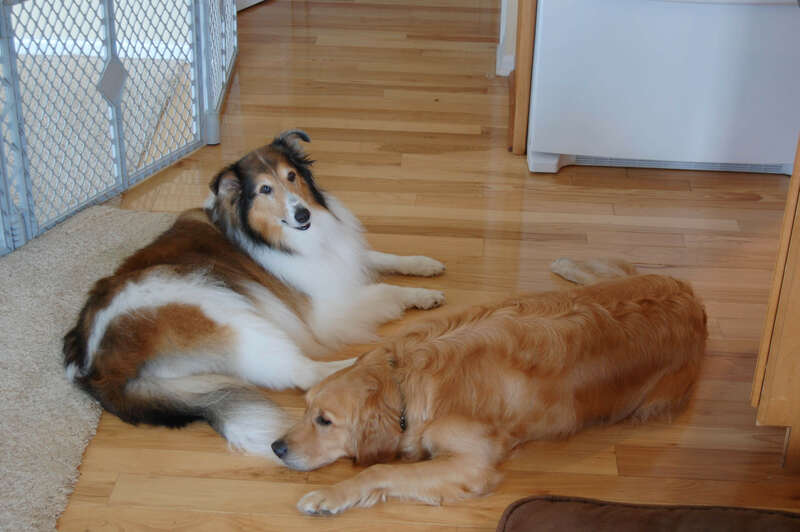 Wrigley thinks they are best buds…not too sure if Sydney feels the same way about him. On Sunday our friends Mo & Ali, and Troy & Christine came up to go tubing and hang out. 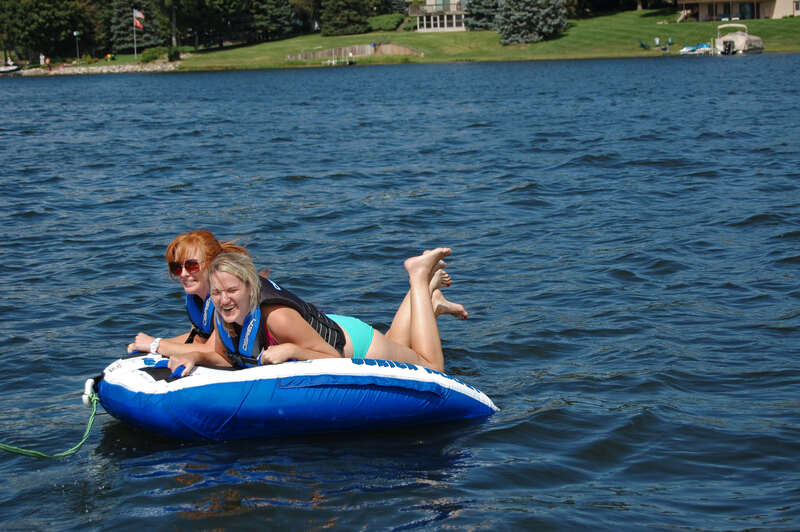 Ali and I tried tubing together….much harder than going by yourself! 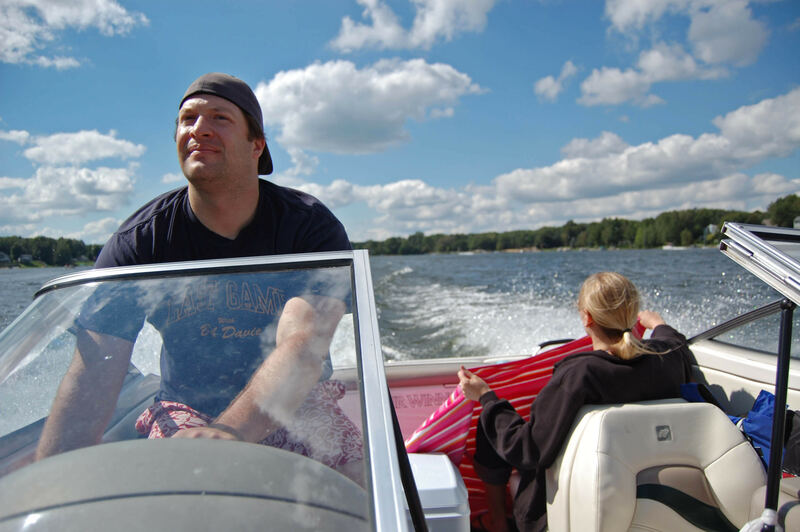 This was before we took off…don’t worry, those sunglasses stayed on the boat! The boys tried to knock us off…be we held on for what seemed like forever. Until eventually we fell off. The sheriff was on patrol and came over to tell us to hold on next time. Gee…thanks? He must have a fun job. Up next was Mo and Troy. They were showing off. Thankfully the Captain, aka the husband, knocked them off pretty quickly with his excellent boat driving skills. 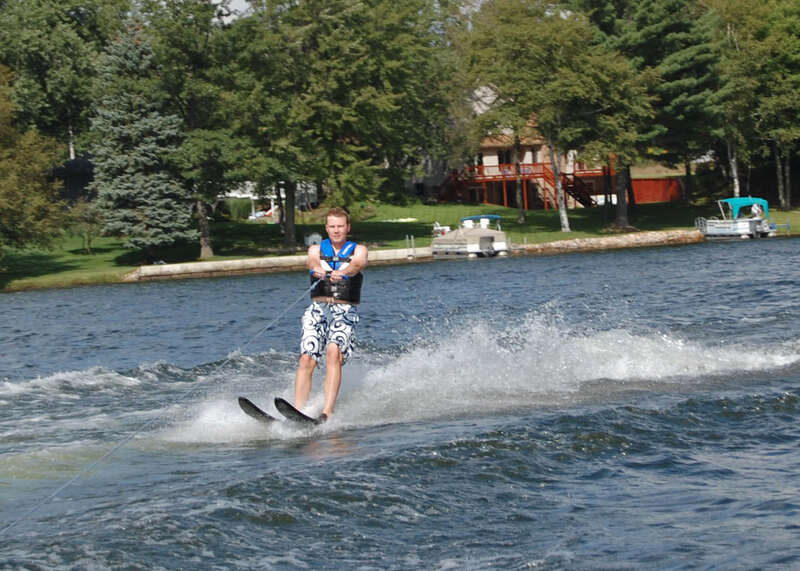 Troy showed us his awesome water ski moves. 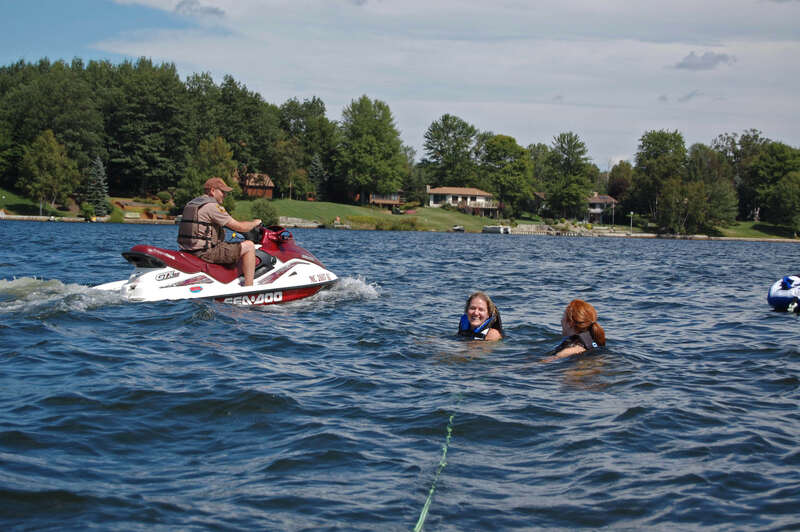 I’ve been wanting to try water skiing since we bought the boat (it even came with skis!) and decided this was the weekend to try it out. Unfortunately when Ali and I got knocked off the tube I got some water in my lungs and couldn’t stop coughing. I don’t think coughing and water skiing mix well. Maybe I’ll get a chance next year? After all that fun, even the pups were exhausted! I hope you enjoyed your weekend, and if you are back to school today make sure to have fun! melts my heart seeing Wrigley and Sydney! 🙂 Happy Tues! How fun!! "Hold on next time.." Right…? Oy. Looks like a fun time though!!! 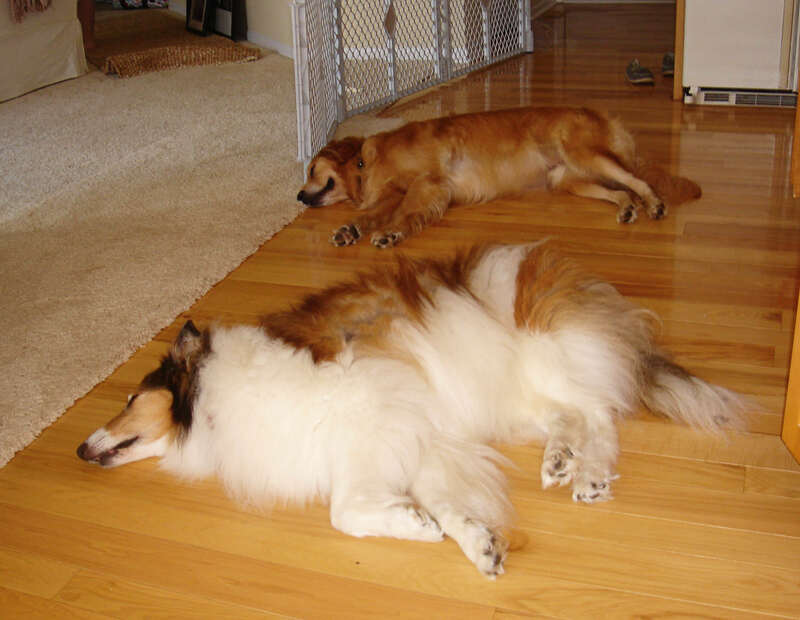 Those are some tired pups, lol!! looks like such a fun weekend! your pups are too cute! Looks like you had a wonderful and exhausting long weekend! Glad you got out on the water! 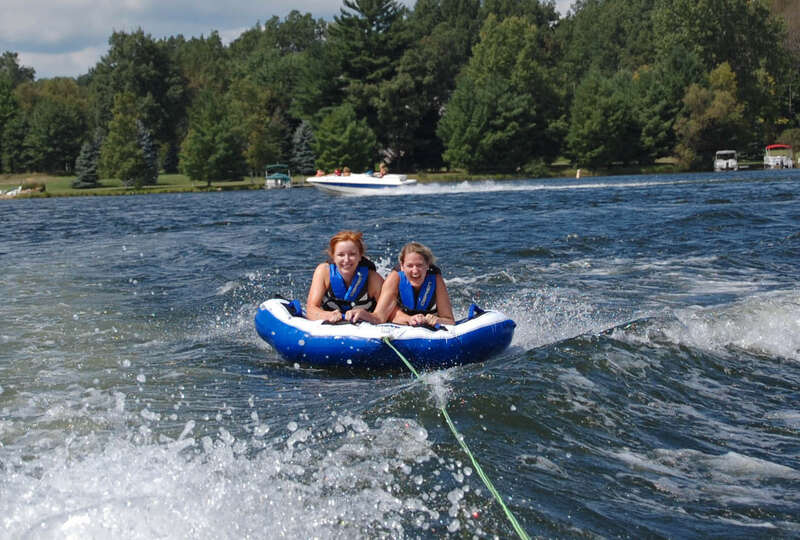 Tubing is one of my favorite water activities!!! Sound like a fun weekend! Glad you have fun – hope you have a great school year! I'm jealous that looks like SO much fun! What a fun weekend! The dogs are so precious! It looks like so much fun out on the boat! Sounds like a great weekend. The doggie pictures are just precious. Looks like you all and the dogs had a blast! 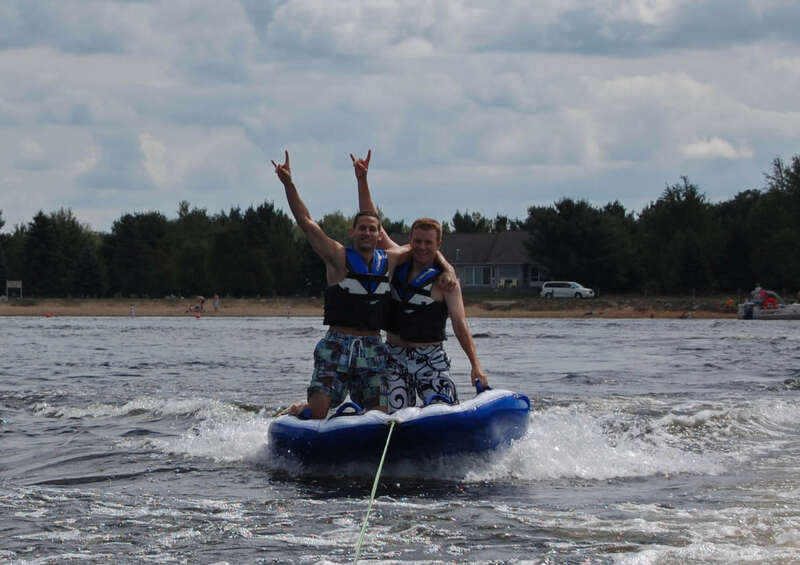 Definitely a great way to end the summer! It was freezing here yesterday but we went to a pool/hot tub party anyway. Aww those dogs are just tooo cute! Looks like such a fun time! Super photos! Love them! I`m guessing you have a lot of fun!